Tony Sly / Joey Cape - Acoustic Volume 2 out June 19th! Preorder now! 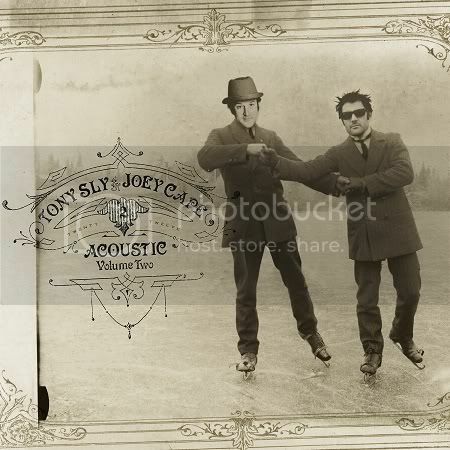 We’re thrilled to announce that on June 19th, we’ll release Tony Sly and Joey Cape’s second split LP, Acoustic Volume 2! Joey’s side features five acoustic Lagwagon songs and a new tune while Tony performs five stripped down NUFAN numbers and his own new song. Check out what Joey Cape had to say below! Last year Tony and I collaborated with Jon Snodgrass and Brian Wahlstrom and released an LP called Scorpios. It was great fun, but the original split we did in 2004 for Fat Wreck Chords, entitled Acoustic has often been in our conversation over the years. We perform so many No Use For A Name and Lagwagon songs in our acoustic sets. After extensive touring together and almost 8 years since Acoustic, it seemed like a good time for a sequel. The new split, simply called Acoustic Volume 2, came together naturally and effortlessly. I have always liked the idea of an acoustic version of a band’s song. It’s nice to hear it stripped down. My feeling is, the song often rings more true and its original inspiration is honored. But hey, I’m an old man. Hahaha. Just hope others share my feelings. Preorder Acoustic Volume 2 and the first Acoustic Split (on color vinyl for the first time ever) now!